Why we can’t “get fit:” Societal standards, negative-feedback loops, and the hedonic treadmill. Many of us work out to “get fit.” But “getting fit” doesn’t really exist in the world, except as an ill-defined idea. In a multitude of ways, it’s just vague: The “standard” for fitness is mostly unclear—is it how bodies perform? Is it how bodies that can supposedly perform should look? What particular kind of performance is it? Running? Bodybuilding? Or is it about looking like we can perform some particular physical activity (regardless of whether we actually can)? But let’s not stop here: “Getting fit” is vague in various other ways: When does it “end”? (In other words, how do we know we’ve “gotten” fit)? Is it when we’ve reached some particular aesthetic standard? Some particular functional standard? I’ve been training for most of my life, and I’m no closer to answering these questions—not that I think they need answering. Because these ideas are so vague, and the questions seem to yield such contradictory answers, my conclusion is that our notions of “getting fit” are (and have been) entirely missing the point. We need to do away with this idea because it doesn’t correspond to reality in just about any way that matters: Our aesthetic preferences are mostly relative and culturally bounded (with the exception of a very few, very basic tendencies—which is why, say, some facial expressions and unconscious body language are universal). And we can’t match up a certain standard of beauty with the supposition that bodies that achieve it will perform better. Because our bodies are all different, what they would look like at their highest level of physical performance will always reflect deviations from that aesthetic standard. We can’t get to both at the same time—even though they’re supposed to come together. It’s one of society’s false promises, and an unfair burden to place on our shoulders. “Getting fit” doesn’t reflect reality. Suppose that you somehow “got” to the standard. There is still no “arriving,” in the kind of spatial sense where if you got to your destination, you’re there. The human body doesn’t work that way. It takes work and activity to stay at any particular level of performance—which is why elite atheltes spend most of their day training. See, not even they have “gotten” fit: they’re still working at it, and they’ll have to work at it forever to keep it. But most of us are embedded in our society, and seeking to live by its standards (consciously or not). When we try to “get fit” without deconstructing what that means, we’re likely to fall into many of these traps. If we come at society as a layperson, as someone who “just wants to work out, and dude, take it easy on the philosophy”—or whatever—we will face frustration, discouragement, defeat, and ultimately bitterness. We went to “get fit” with the best intentions, but we never “got” fit, did we? Most of us just succeed in spinning the wheel of insecurity and self-loathing that much faster. We got into it trying to get it to stop. But it never stopped. And the reason for that is that “getting fit” promises that we’ll “get” to that goal—when that goal never really did exist at all. To unpack this we have to talk about the hedonic treadmill. The hedonic treadmill is a philosophical (but now also psychological) concept that comes down to the idea that people will, for the most part, have a relatively stable level of happiness throughout their lives. Supposing that the idea is correct, we’ll never become significantly happier, no matter what we do. Biologically, however, it makes perfect sense. Feelings of happiness are linked to a variety of hormones and neurotransmitters, including but not limited to serotonin. 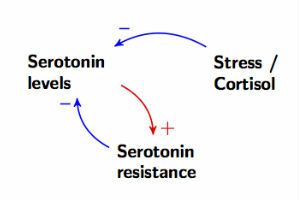 When there’s too much dopamine (as is the case with cigarette addiction), the brain becomes desensitized to serotonin. 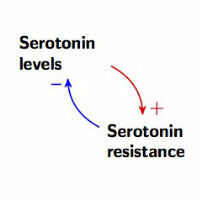 As shown in the diagram below, levels of serotonin are self-regulating: if there’s too much serotonin, (red arrow), the brain will become resistant to serotonin, and levels of serotonin will ultimately drop (blue arrow). This loop is also why we can’t stay super happy: due to a variety of mechanisms (which are too many and too sophisticated to talk about here), serotonin levels can’t stay “elevated.” If we try to keep them elevated with narcotics or exercise, they’ll just become the new norm. (This is known in systems thinking as a negative-feedback loop or regulatory loop). Because serotonin is linked to happiness, we can say that our levels of happiness self-regulate in the same manner. In a nutshell, that’s the hedonic treadmill. But that’s not the biggest problem: Because most of us don’t achieve the standard of “fitness” because it doesn’t correspond to the ways in which our particular bodies express performance, we become frustrated. So there’s another player in the game: as our frustration rises, so does stress—(thanks to another important hormone: cortisol). (All this is rather directly tied into the founding ideas of our society: The Declaration of Independence states that some of our inalienable rights are “life, liberty, and the pursuit of happiness.” Notice the wording: pursuit. Not happiness. This is an acknowledgment of two things: first, an implicit knowledge of the hedonic treadmill, and second, that happiness is only attainable for some, if any at all). We’ve gotten onto the hedonic treadmill, and we can’t really move along it. And what’s the reason? Because we’ve been defining our goals in such a way that they’re vague (and therefore unattainable). In order to circumvent this problem, we must define “fitness” as a process. By defining fitness in this way, we haven’t gotten off the hedonic treadmill (because we can’t), but we’ve managed to keep the prospect of “getting fit” from being an added stressor. There’s a simple way to do it: The slow progression. The slow progression is a technique where you commit yourself to very small, but very steady increases in any activity. The example I’ve given previously is as an endurance-developing exercise for the beginner athlete: begin running 2 minutes a day, for 2 weeks. You keep adding 2 minutes every 2 weeks, until at the end of the year (52 weeks later), you’re running 52 minutes a day, every day. Let’s break it down: The slow progression provides a very steady, and very consistent dose of accomplishment—perfect for the hedonic treadmill. But it also illustrates a broader principle (and for our purposes, a concrete tactic): If you set more and more easily attainable goals, you’ll keep the hedonic treadmill satisfied on an increasingly consistent basis. Note that this doesn’t mean that you should set your standards low; remember that you’re still on the hedonic treadmill. If you set them low, you’ll stop improving, and the hedonic treadmill feeds only on improvement. But that’s the key: Although we can’t get off the hedonic treadmill, there’s no reason for us to remain beset by its existence. We can use it to galvanize ourselves into a continous process of achievement and development. But we have to be aware of it, and we have to understand how it works. In other words, we have to use available psychosocial resources (one of which is the slow progression). There’s no other choice but to approach life with a little bit of humility, so that we don’t set goals that are too large or too unlikely, and with a little bit of discipline, so that we can safely walk on the hedonic treadmill: slow and steady. Meditation, gratitude, surrender to the present moment and acceptance of the inherent impermanence of all things is a/the way to transcend the HT and the suffering that accompanies identification with this illusion. If your goal is to become an elite runner, then the process you outlined is sound. If, however, you are part of the majority who want to experience the joy of being with a baseline level of ‘fitness’ (sorry, couldn’t really avoid the term here), forget “continuous process of achievement”. Instead, if, and only if, you like running but you’re not an elite runner, try running 1 mile a day, every day….for as long as you can…until you can’t (because that time will come, even for the elite runners). Stop striving for better or more, get off the ‘when I have achieved……then I’ll be….. trap (aka, the HT) and allow yourself to be. It’s fun, it feels great, it takes very little time and very little toll on the body, it cultivates self-acceptance and self-compassion and, most important of all, ‘fitness of being’. I agree that not everyone has to get fitter, as you point out. What I’m suggesting applies to those people who do intend to get truly fit and healthy (say, because we believe that the body is a temple, and we want to make sure that its foundation and architecture is well-wrought). The body is always striving for better or more—specifically for better and more effective ways to stave off entropy. As far as the body is concerned, being IS becoming. As soon as the body stops “becoming” (growing, regrowing, repairing) it heads towards ceasing to be. In effect, the ‘fitness of being’ is no more static than the ‘fitness of getting fitter’ is.